The Center for Disease Control and Prevention (CDC) released a detailed study earlier this year about the Attribution of Foodborne Illness in the United States between 1998-2008. As mentioned by Modern Farmer in a recent article, a majority of the cases reported were due to uncooked greens and under-cooked meat products. Although beef and poultry can be cooked longer for a piece of mind, the consumption of raw vegetables is a greater challenge. It’s common knowledge in the US that eating raw vegetables is “healthier” than eating them cooked- it’s also much more convenient this way… The downside is that we are more susceptible to pathogens carried on leafy greens. This is probably why my Asian friends prefer to ordering dishes that contain veges that have been skinned just prior to cooking, like potatoes, cucumbers, carrots, radishes, etc. Anything that looks the same straight off the farm (like lettuce, spinach, bok choy, etc) are less likely to be cleaned properly in the restaurant kitchen. 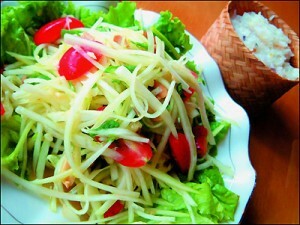 Different countries have their own traditional ways of prepping salad. In countries like China, Korea, Japan, Vietnam, and Thailand the hygiene of its preparation is often questioned. In most cases copious amounts of garlic, peppers, lemon, ginger or other ingredients might be used in order to help naturally kill whatever is catching a ride on the leaves. 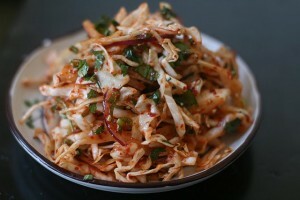 Here are some samples of “salad” according to Asian tastes. 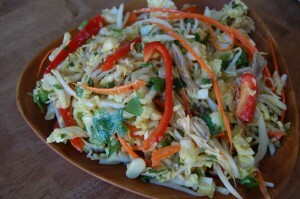 Green Mango gives this salad a kick! Read how to make the above one at the Nourishing Gourmet. 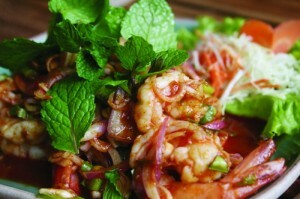 Find out how to make the above one at New Asian Cuisine. 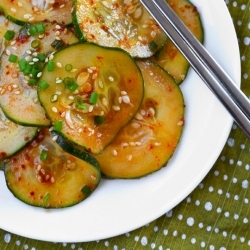 Get your onions, peppers, garlic, and radishes ready to make this one! Not very convenient? Try making a large salad and keeping it in the refrigerator. That way you can enjoy if over the next few days at school or work. 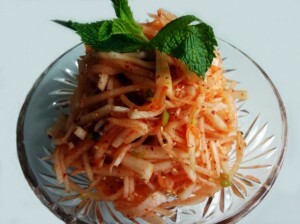 Some types of salad, like Kimchi, can be made and preserved for weeks!